The second coming on Wah wah 45s for the mysterious duo from Southampton! The Part Time Heroes have seen themselves thrust into the limelight in the last 12 months, following their first release on Wah Wah and the 'Realise' EP on Mum's The Word. Gilles Peterson and co went nuts, the boys smashed it live at Cargo and The Big Chill, and ended 2006 with a Maida Vale session and a nomination for single of the year. 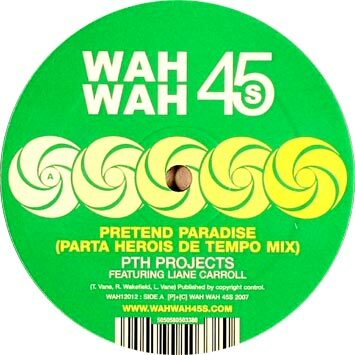 Their second release on Wah Wah 45s sees them return to their PTH Projects alias once again, as they re-work 'Pretend Paradise', their collaboration with 'BBC Jazz Artist of the Year 2005' Liane Carroll. The 'Parta Herois De Tempo Mix' is unsurprisingly a latin flavoured re-jig that grabs the dancefloor by the balls and refuses to let go until the samba heavy crescendo! 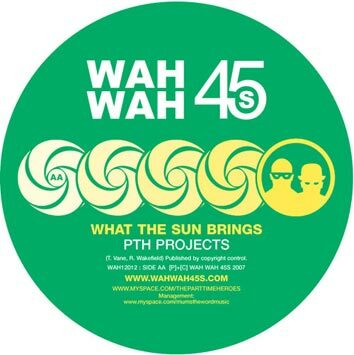 On the flip, the PTH boys come through with the brand new 'What The Sun Brings'; another uplifting club cut, reminiscent of RSL at their best. I hope all is well and you're not feeling the cold too much. Today sees the release of our third 12" on Wah Wah 45s. It's a rework of our track Pretend Paradise, ft.Liane Carroll. Its a monsterous, broken beat latin stomper, that's garuanteed to smash up any dance. The B side, is another dancefloor led beauty called 'What The Sun Brings.' Its what happens when you're in the studio and you get a glimpse of spring after a miserable british winter!! Huge thanks for the support......things are definitely moving along nicely. The PTH album is well on the way....some incredible vocalists and wonderful players are all beavering away as we speak, so I'll keep you posted on how things progress. We're hugely excited!!!! Look out for a some more releases over the next couple of months. Two remixes and a collabo that we've done with Monday Michiru, along with a remix for Up Hygh on Tru Thoughts. I'll let you know the dates as soon as they're confirmed.